Nona O’Carty was in the wrong place at the wrong time. She witnessed a brutal and seemingly senseless murder. At the same time, she was struck by a bullet which left her alive – but totally deaf. She was completely unable to communicate what she knew – and she was not even sure how much she had actually seen and how much she had imagined. She was terribly, dreadfully alone. And there was no place to run – because now the murderer was stalking her, to ensure her silence… forever. Lancer Books 1968. 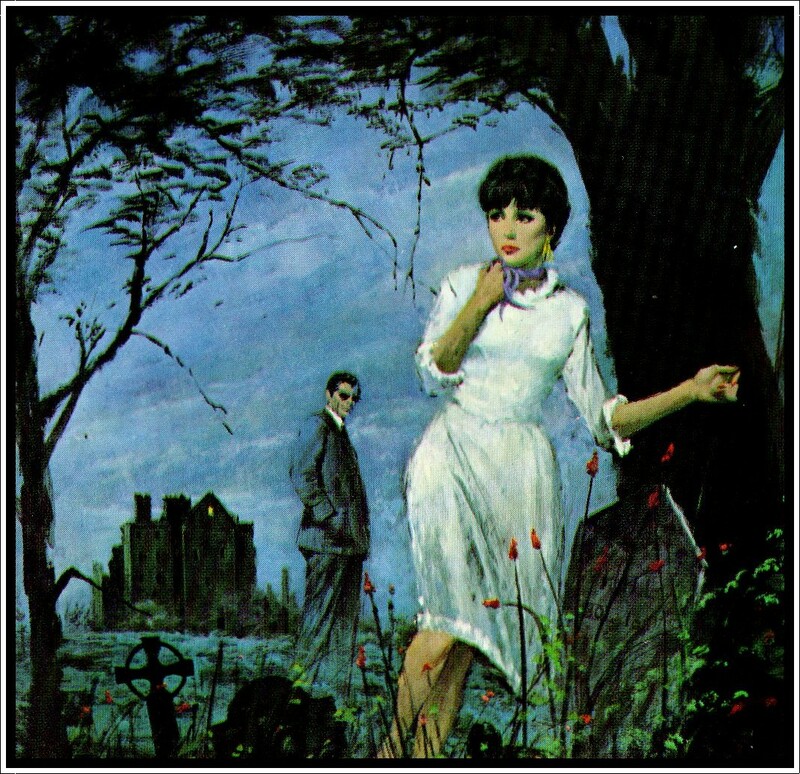 Cover art Lou Marchetti. 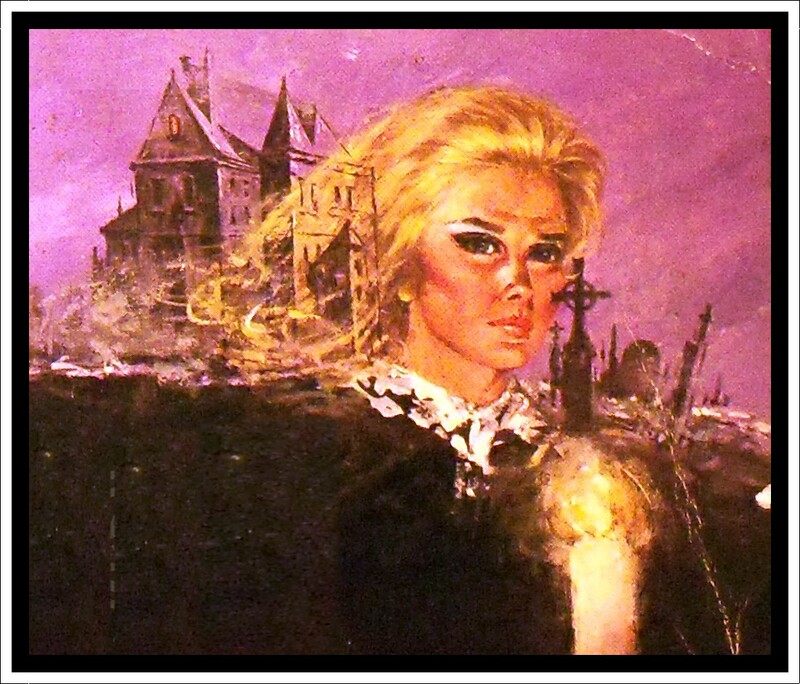 Just when I thought I’d seen most of what Virginia Coffman has to offer gothic-wise, along comes another one! Of course Deaf, Mute and Dead would be the more politically appropriate, though far less alliterative, by-line for today’s back blurb, but I guess this was 1968. I’ve had a quick flick through the first couple of chapters – the heroine, Nona, has a golden ticket for a royal wedding and she has travelled to England on a once in a lifetime trip from her hometown in Ireland. She is staying at the ‘little’ Richmond Hill Hotel, and this made me smile, for when my family first moved to the UK, we actually lived in this hotel for a few months – and I remember it as being very, very big! (Though I was quite little myself at the time and buildings do have a habit of shrinking as you get older). 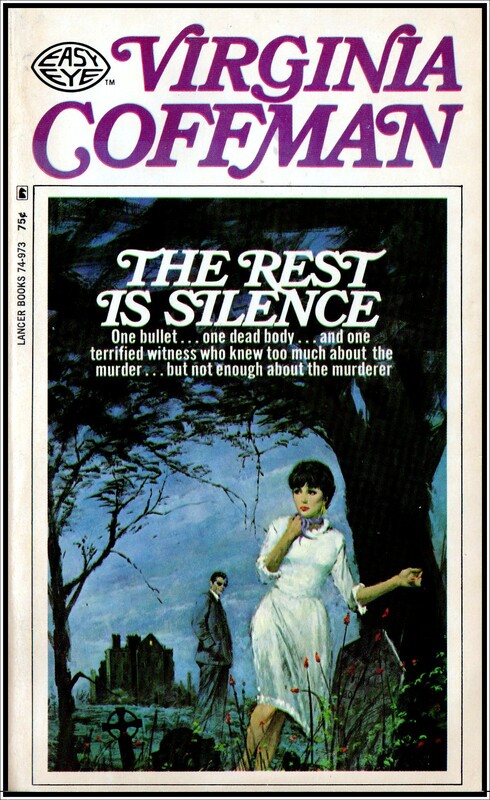 Anyway, along with Behind Locked Shutters and The Twilight Web, this cover gets filed in the ‘shady-looking men wearing shades’ section of my bookcase. Since the dawn of civilisation, the secret cults – hiding in the dark corridors and gray shadows of night – have ruled the world. Studying cave drawings in the south of Spain, Joan Lambert stumbles on evidence linking the secret witch masters of today with the damned of centuries past…and the dark minds of today control powers as great as the ancients. Discovered by guardians of the dreaded knowledge, Joan flees for her life…but finds herself unable to outrun the nightmare pursuers. Only one place offers the hope of safety…and then she finds that it too is a puppet to the witch cult! Copyright 1969 by Script Associates Ltd. Published 1969 Lancer Books. 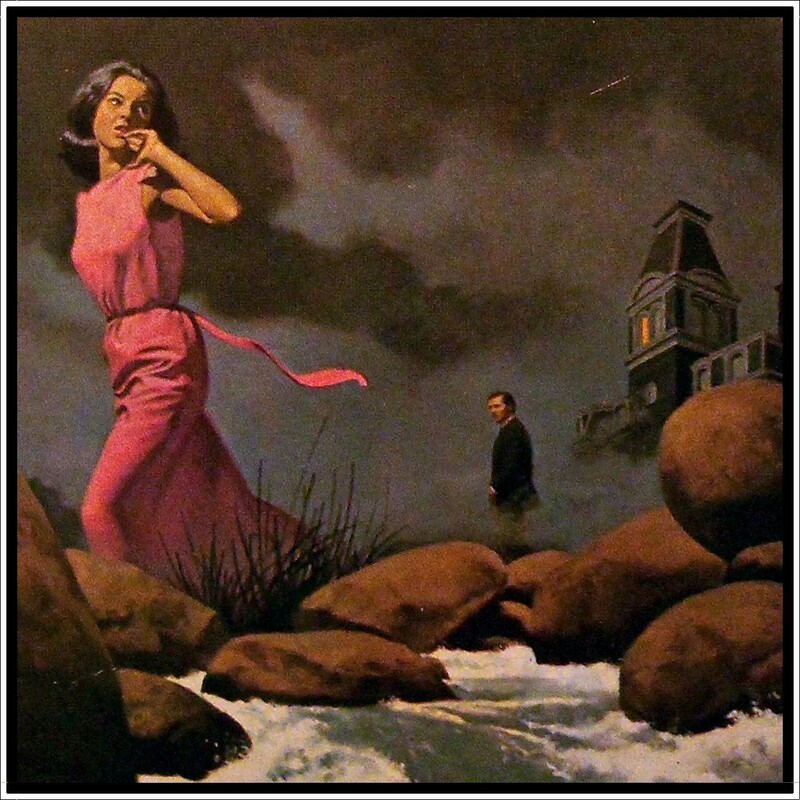 Cover art Lou Marchetti. Joan Lambert is a somewhat uptight archaeologist who has suffered a terrible trauma on a dig in the Pyrenees. Alone in a cave, she had discovered ancient relics unequivocally proving the existence of a witch cult in Western Europe that antedates the ancient Egyptians by thousands of years. She also unearthed a terrifying, disembodied presence with fiery eyes that almost killed her, and which continues to threaten her with paralysing flashbacks to this day. Concerned for her welfare, Joan’s true love, fellow archaeologist and museum curator Wilfred Allen, has summoned her to his isolated mansion, Glen Oaks, in order to introduce her to a select group of psychiatrists, psychical researchers and scholars, whose combined knowledge of all things occult, he is convinced, will dispel Joan’s awful visitations once and for all. There were dreams just as real. Dreams in which flesh bruised flesh , moist lips parted and you felt yourself to be caught up and held in strong, imprisoning arms. To be held captive in so rapturous a way surely had to mean that there were depths beyond depths in the human mind, and that somewhere buried deep in the mind there was a wild, free world where dreams were the only reality. Unfortunately for Joan, Glen Oaks turns out not to be the haven of tranquillity she has been hoping for. Bizarre rituals and horrifying murders have been occurring in the woods. On her drive to the house, a monstrous being forces her car off the road, causing Joan to flee into the arms of Sheriff Forsythe. He has been investigating the murder of the local village idiot, Willie, and his suspicions are piqued when he notices the resemblance between Joan and a little wax doll found near Willie’s body. He takes her to Glen Oaks where Wilfred and his guests are waiting anxiously, and Wilfred’s reticence under questioning makes the Sheriff even more suspicious. That night, Joan falls into an uneasy slumber, only to be woken by the midnight whisperings of a roomful of shadowy figures standing around her bed. One by one they hypnotise her into believing Wilfred is in mortal danger and only she can save him. So Joan has no option but to sleepwalk right out of Glen Oaks and right into the woods where she believes she will find her beloved. The branches of the towering oaks were destitute of all foliage now, and swayed in the slight breeze, looking as brittle as the bones of waltzing skeletons in a danse macabre, and the moss on their boles had shrivelled and died after turning a lichenous gray. 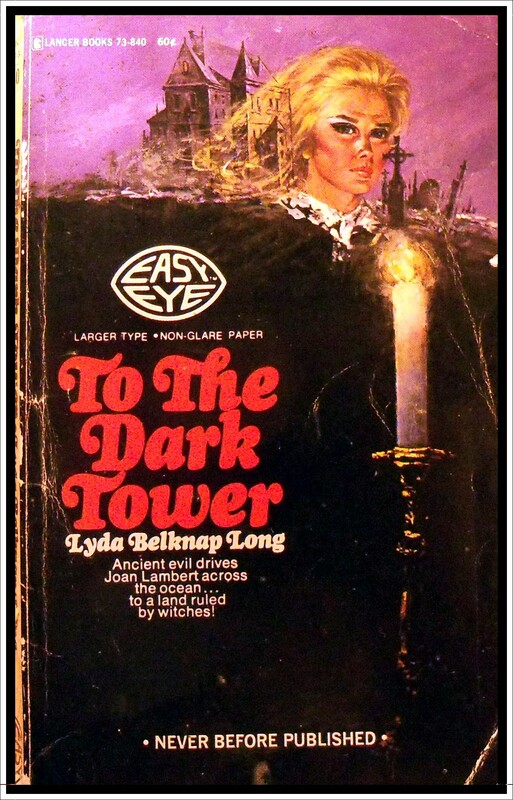 Dark Tower, with all its lush descriptions of midnight woods and nameless terrors, was a great gothic read. The ‘unseen horror’ that had attached itself to Joan in the caves and which continued to menace her was very effectively done and I wish the author had stuck with this rather than distract us with all that witchy jiggery-pokery. There were also too many long discussions between characters explaining away the plot and adding unnecessary asides – including a slightly surreal and completely irrelevant conversation about the satanic connections of Joan of Arc while our very own Joan was being gagged and bound to a stake. Overall though, there is a lot to like about this book. Which begs the question, if you were writing under a pseudonym would you add a dedication to yourself? Why?! Or was this book actually written by his wife? The copyright gives no clue since it is by Script Associates Ltd so maybe neither of them wrote it! 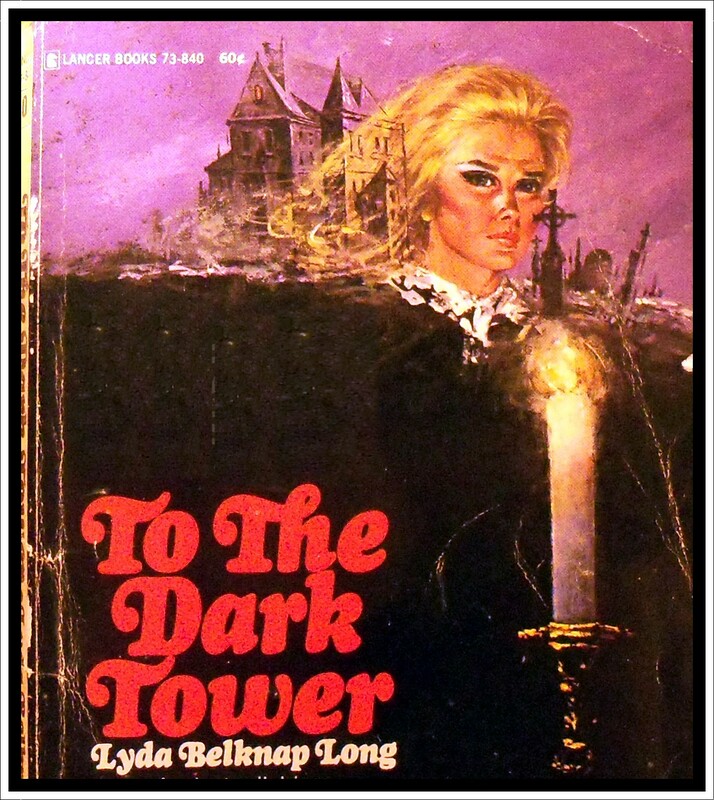 Anyway, I would recommend the Lyda Belknap Long gothics if you can find them. Four out of five stars.